I love anything with ginger in it (especially things like Ginger Crunch) and coconut. This slice has all the right combinations and is super easy to make. Melt butter and syrup over low heat. Sift flour and ginger, combine with sugar, coconut and lightly beaten egg. Pour in melted butter and golden syrup. When well combined press into well-greased 28cm x 18cm (11in x 7in) lamington tin. Bake in moderate oven 25-30 minutes. 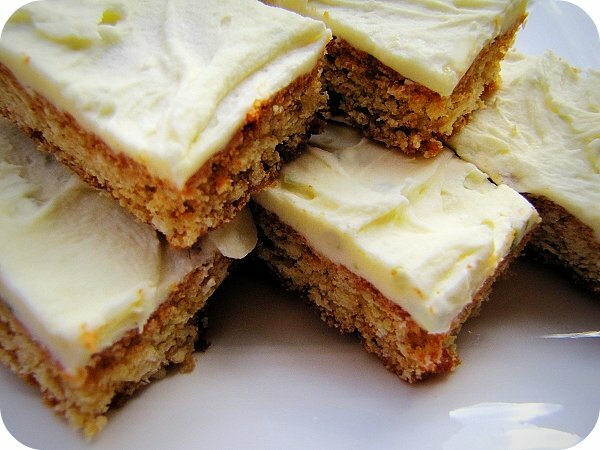 When slice is cool, spread with Lemon Icing and cut into squares. Lemon Icing: Sift icing sugar into bowl. Combine soft butter, lemon juice, grated lemon rind and hot water, stir until butter melts. Mix into icing sugar, beat until smooth. From "The Big Book of Beautiful Biscuits" (Australian Women's Weekly). Oooh yeah I love this slice, one of my regular favs. AWW do the best cookbooks! Yum, with the lemon icing too! Will try once I have a kitchen and baking utensils again! I must try this! Some of hubby and I's favorite combinations :) Ginger and Coconut! YUMMO! love the combo of lemon and ginger! must make it sometime! oooh gosh Kristy, STOP IT! All this fancy food makes my mouth water ;) how on earth am I going to try to consume less sugar when treated to this lovely eye candy? :P well, it's my responsibility, and the cake looks lovely, definitely going to try the recipe! I heart ginger too! I'm going to make this tonight to bring to the cabin this weekend. We're expecting cold weather up there. It's end of May for Pete sake, but then again I live in Minnesota.